A strategic merger in 2016 which led to a larger white fish quota has enabled a Lüderitz fishing company to expand its land-based processing by almost 100% in a time when other fishing companies are rationalising their operations. 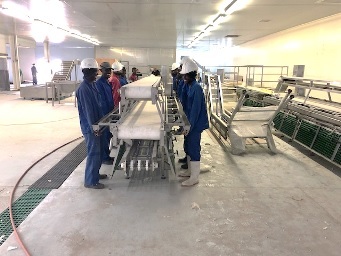 One of Lüderitz’ oldest fishing companies, Marco Fishing, this week announced it is near the end of building a new fish factory adjacent to its existing facility. The new factory adds almost one thousand square metres floor space as well as new sorting, filleting and skinning lines, and an impressive three-unit IQF spiral freezer. These very significant expansions follow in the wake of the merger with Mekarilakha Fishing which gave Marco access to a bigger longline hake quota. With the new building’s outer shell completed, contractors and suppliers have been working around the clock with the interior furnishing. Marco said the combined factory is now almost double in size with much improved processing capacity based on the latest technology in hake processing. Expanding the factory is one of two components to align the company’s operations with its bigger output. The other is a new longline vessel, the MFV Meka Bay, which was acquired and commissioned earlier in the year. This vessel has already been fishing during the past season. “With this Marco Fishing (Pty) Ltd is further re-emphasizing their commitment to the regional development and specifically investment in the town of Lüderitz. The new factory and related processing capability as well as the new vessel will result in additional job creation in excess of 100 people,” stated Laufer.